In the dance industry, professional certificates are granted to dancers who enrol in a dance training course, and pass an exam satisfactorily. This will typically form part of your overall credentials to becoming a professional dancer or teacher. The examination consists of a 30 minute session where the dancer will demonstrate the above qualities on the PDM. No written exam is required to successfully attain a Danceacise certification. The Professional Certification process offers extraordinary benefits to dancers and teachers, deeply enriching their techniques and performance, and greatly expanding their career opportunities. The process of preparing for your certification exam will teach you the dance concepts you may not have fully understood. You will improve both your verbal and presentation skills. You will learn the precise vocabulary for describing the technical elements of dance moves, which will help your explanations become clear and consistent. Your knowledge of the precise alignments will improve your ability to choreograph routines for your students. You will expand your knowledge of musical terms and concepts, and you will understand how dancing and music relate. Finally, the process of technical mastery will improve your eye, so you will know instantly how to correct your students. 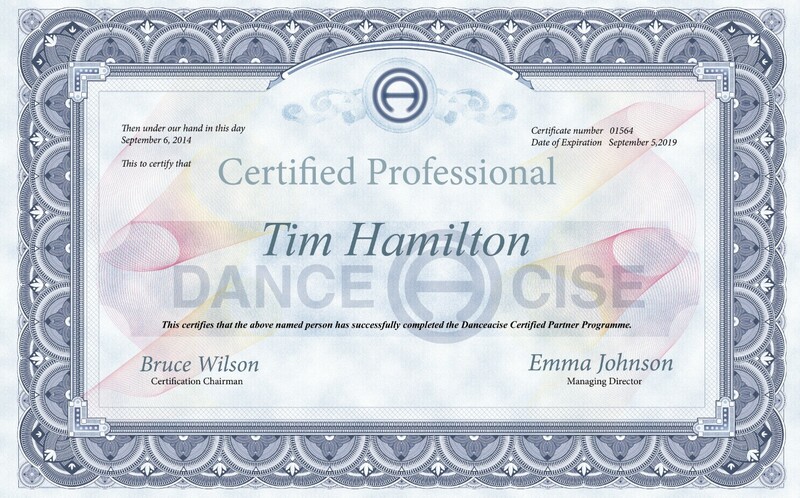 The technical expertise required to pass your certification exam will catapult your dancing to an entirely new level. You will learn the “rules” of technique that will keep your dancing consistent and help you master new, advanced moves. You’ll develop a language that will help you work more effectively in your dance partnerships. Above all, your confidence will soar with the true mastery of dance technique that will stay with you for the rest of your career. The certificate you receive when you pass your certification exams declares your expertise to the world. You’ll be able to attract serious students and earn more for your services. You will be a desirable employee in dance studios around the world. You can even obtain your judging credential. Your certification is the first step to being recognised as an international expert. Preparing for a certification exam can be a daunting task. Studying with a Danceacise Certified Professional (DCP) gives you unparalleled insight and clarity, and a deep understanding of the overall principles. Your studying becomes more efficient and effective, allowing you to pass your exam with confidence. We offer professional dance instruction in both English and International styles in preparation for the exams. We can establish a study timeline and framework that is customised to meet your individual schedule and professional goals. We have both written and video tutorials that are geared towards both dancer and teacher. With a DCP coupled with the wealth of information and support Danceacise have to offer, we are confident we can help you to succeed! We offer many creative study options to help you prepare. We offer programs for teacher training or certification with specific budget and time considerations. Let us help you in learning how to teach dance. Danceacise can come to your studio to organise an on-going program to give you and your staff the tools necessary to succeed in becoming certified. We will create a program tailored specifically for your staff and your business needs. How to Train for Your Professional DanceacisePro® Exam” DVD and workbook demonstrates everything you need to know to pass your exam. The program includes complete dance demonstrations, the required “solo” dance demonstration, the correct way to answer the questions in the theoretical and teaching sections, and practical mock examinations. The Certification Workbook gives sample questions and answers, as well as full explanations of the different parts of the exam. Designed for people who wish to enhance their dance technique, take dance as a profession or become a dance teacher our programs offer intensive instruction, study, and practice of various DanceacisePro® syllabi. They vastly condense the time you need to spend preparing for your exams. You will leave fully ready to take your DanceacisePro® certification exams. If you have a passion in dance and wish to take it to a whole new level, contact Danceacise today.